I’ve been using Crowdfire social media management tool on Android for a few months now, and I’ve been a paying customer for a while. So, I think it’s time to share my thoughts on it, and why you might want to give it a shot. Disclaimer: a small promotional consideration was paid by Crowdfire for this post. But I probably would have written it anyway. Scheduling: I’ve used Twuffer in the past (and I still occasionally do), but I’d like an easier way to schedule tweets on my phone. Tracking: I’d like to track how my follower count is doing, and how well I’m sending out promotional tweets. I don’t want my Twitter feed to only be a shill-broadcast of self-promotion. I use IFTTT for certain things, but I want to have some degree of control over what I post, the hashtags I use, the phrasing, etc. There are a lot of tools out there for doing this, but many of them don’t solve all these problems (especially the last one). I don’t remember where or how I found Crowdfire, but it’s now something that I use every day. Literally it’s one of the first things I do when I wake up in the morning. It has a lot of capabilities, I’m only going to cover a few in this post. It’s not a replacement for my Twitter client of choice. I still use the Twitter app to do all my reading and a bunch of my tweeting. 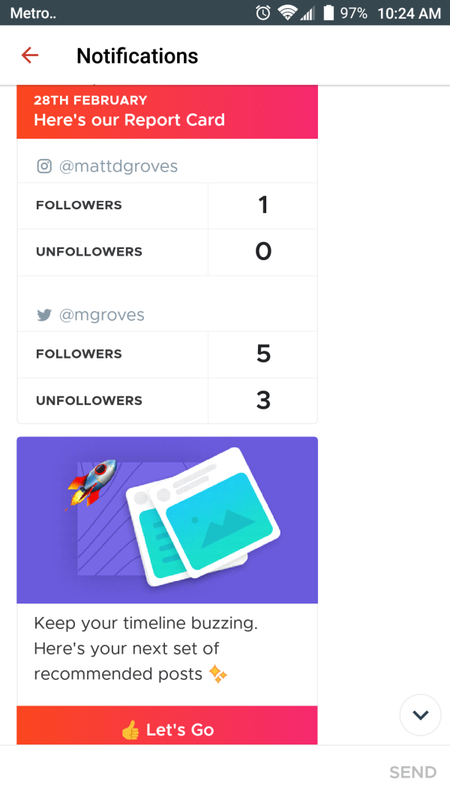 If I turned over complete control of my Twitter/Facebook/etc account to an app like Crowdfire, IFTTT, etc, then I think I’d be missing the point of social media. I want to be a real person that people can talk to and not just an automated feed of links. 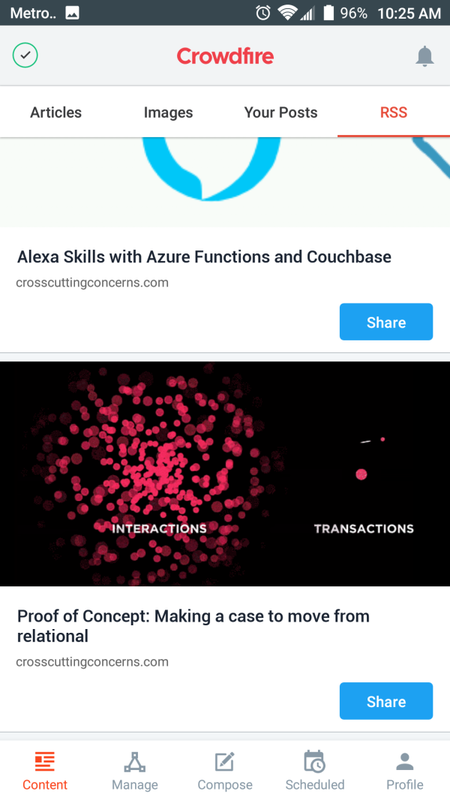 Whenever a new post hits the Couchbase blog, I get a notification and prompt to share the post (whether I wrote the post or not). I also get a report every morning showing the number of followers and unfollowers since yesterday. This provides me daily feedback on whether I’m getting too annoying on social media or not. Also, when I share a post on Crowdfire, it will automatically schedule to tweet them up to 4 times over a 30 day period at the "best time" of day. I’m not sure how they calculate this, but it spaces out my tweets nicely, and I’ve found that repetition of tweets leads to more people seeing them and tweeting with me than before I used Crowdfire. As I mentioned above, not only will Crowdfire remind me to tweet, it will also schedule tweets. Everyone uses Twitter at different times, so it’s helpful to send out multiple tweets (but not too many) to reach everyone that I can. In addition, I can manually schedule tweets. I find this helpful when promoting new podcast episodes. 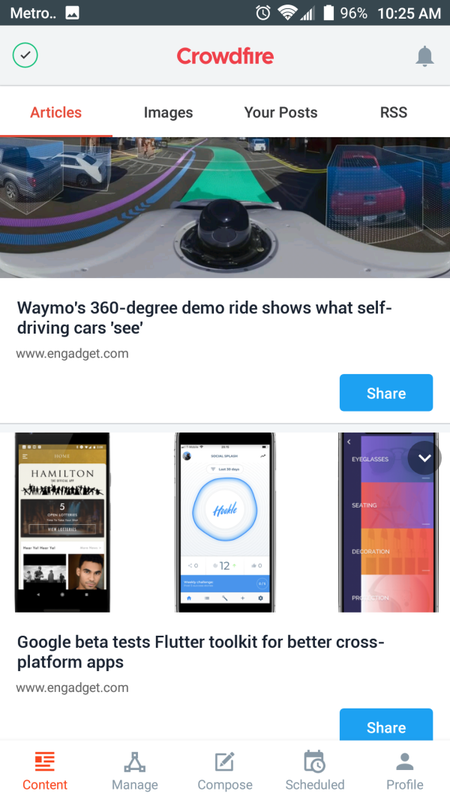 One feature that Crowdfire has introduced after I started using it, is the ability to connect to any RSS feed. Previously I was limited to just WordPress or other well-known engines. 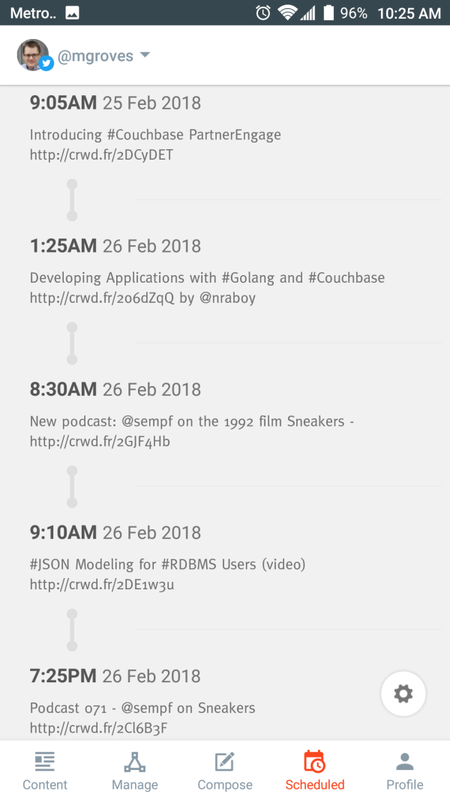 But now I can use Crowdfire with my own site’s RSS feed. This way I can track which posts I’ve promoted on Twitter and which ones I haven’t. I’ve given Crowdfire some keywords that I find most relevant. It will then recommend people to follow or articles to tweet that are relevant to me. To me, Twitter isn’t just about getting a bunch of followers, but it’s about doing a lot of following. I usually find this helpful, but this is probably the area where I think Crowdfire could most improve. I get a few suggestions of people who don’t tweet in English, and articles that I’m not interested in, for instance. Give Crowdfire a shot. They have a free version, which has some limits, but it’s absolutely enough to evaluate the tool and see if you find it useful. Crowdfire is in the Google Play store. Matthew D. Groves lives in Central Ohio. He works remotely, loves to code, and is a Microsoft MVP. Copyright (c) 2011 - 2019 CrossCuttingConcerns.com. All rights reserved.